From the MIT News website: Titled “Truth and Dare,” the 2015 TED Conference — held last month in Vancouver — took a challenging look at familiar beliefs and assumptions. Among the 70-plus speakers offering their views of the future were a number of MIT faces. Abe Davis. A PhD student studying computer science, Davis has collaborated with colleagues to create a “visual microphone.” On stage, Davis demonstrated his technology: a high-speed camera films a potato chip bag from behind a piece of soundproof glass, while a person near the chip bag speaks. When the video is played back, the voice of someone reciting “Mary Had a Little Lamb” can be heard. Davis also shared a preview of his latest project, a video technique that analyzes how an object moves, and produces a clickable image that moves like the real object. 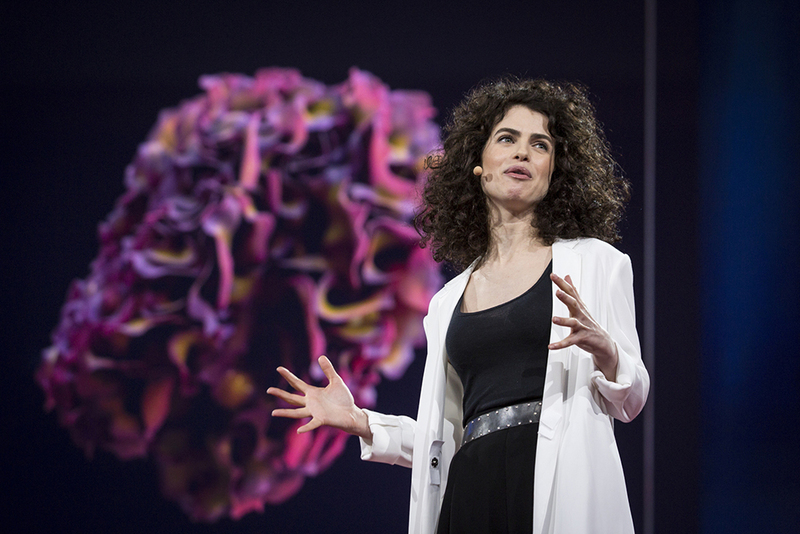 Neri Oxman PhD '10. As director of the MIT Mediated Matters group, Oxman explores “material ecology” — the practice of integrating design principles inspired by nature into digital fabrication. In her TED presentation, Oxman debuted a wearable digestive system that could be worn by future inhabitants of Jupiter’s moons. Powered by photosynthesis, the system is designed to digest matter, absorb nutrients, and expel waste. “Think of it not as evolution by natural selection but evolution by natural design,” suggested Oxman. Laura Schulz. As the principal investigator at MIT’s Early Childhood Cognition Lab, Schulz studies how children learn. On the TED stage, Schulz shared what she has learned about human cognition during a decade of research “trying to figure out how children learn so much from so little so quickly.” In video of her laboratory experiments, she demonstrated how babies can make correct inferences about how certain objects will behave. James Simons ’58. In a session focused on machines that learn, Simons, a mathematician and philanthropist, shared stories from a career guided by his passion for discovery. Following a stint as a code breaker at the National Security Agency, Simons went on to develop a novel approach to understanding financial markets, based on complex formulas and quantitative analytics. Today, Simons is an enthusiastic advocate for math and science education; along with his wife, Marilyn, he runs the Simons Foundation, whose mission is to advance research in the basic sciences. Baratunde Thurston. Closing the 2015 conference, comedian and author Baratunde Thurston offered his own irreverent take on the intense and informative sessions that took place during the week.